These Hot Cross Buns are a spiced sweet bun loaded with currants or raisins and topped with vanilla icing. They’re a traditional Good Friday and Easter recipe! 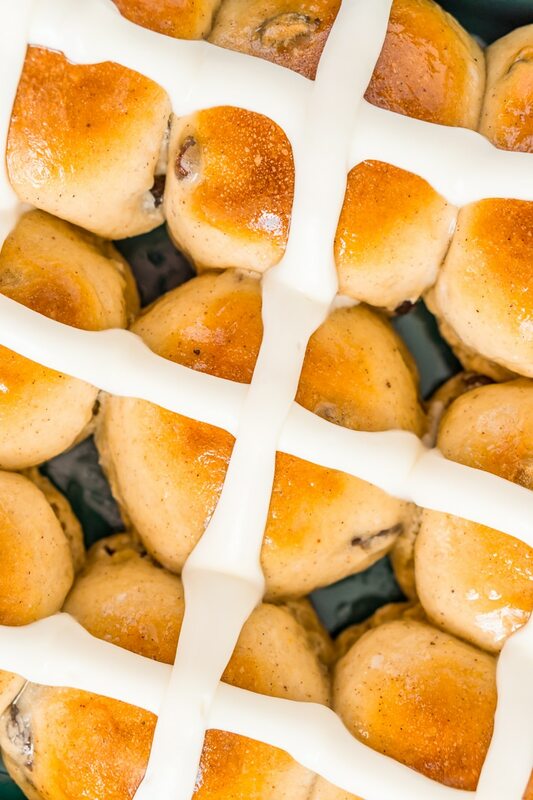 Every family has a different idea of classic Easter food, but for me, no feast is complete without one special treat: Hot Cross Buns! Soft, doughy, and filled with festive flavors, these buns are topped with a cross made of icing, and — you guessed it! — are best served hot. The tradition of these goodies is actually centuries-old. They were meant to be enjoyed at the end of Lent, during which time people weren’t allowed to eat dairy (this recipe contains milk). It was even once believed that a batch of Hot Cross Buns made on a Good Friday would never spoil, but I wouldn’t risk it! Whether or not you’re a churchgoer, I think that the recipes steeped in history are some of the most interesting. Sometimes, it’s not only about taste; it’s also about tradition. 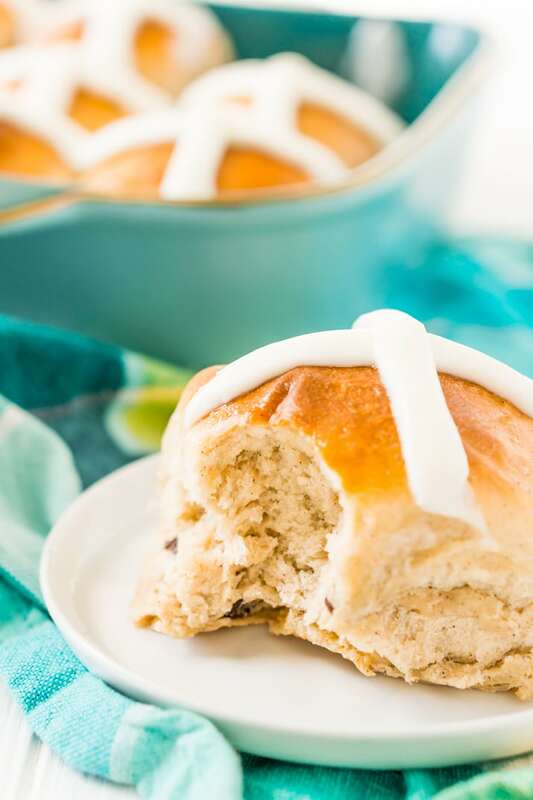 This Hot Cross Bun recipe is filled with warm flavors like cinnamon and nutmeg, and raisins or currants add a touch of fruitiness. But in my opinion, one of the things that separate good buns from great ones is the icing! When I bake these at home, I use this Best Ever Homemade Vanilla Icing Recipe, which is leaps and bounds better than the usual powdered-sugar-and-water kind. This one also uses powdered sugar, but it’s mixed with heavy cream and a dose of vanilla extract. The result is a creamy icing that’s the perfect consistency to “cross” your Hot Cross Buns. It’s thicker than a glaze but thinner than icing, and it only takes about two minutes to make. These scrumptious little rolls are sweet but not overly sugary, and they can be enjoyed at breakfast, as a snack, or alongside the rest of your Easter or Good Friday feast. I love pairing a steaming bun with a cup of tea or coffee in the afternoon for a little pick-me-up. And if you’re planning to be a guest at someone else’s house, these buns travel well and are usually a big hit! 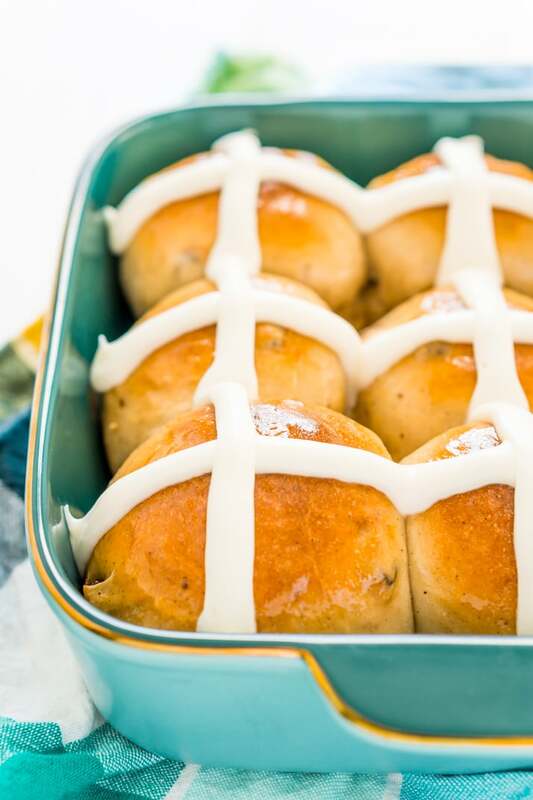 If you’re looking to add some tasty tradition to this year’s Easter or Good Friday meal, try making Hot Cross Buns for your loved ones to share a taste of sweetness and history. Like most rolls or yeast-based recipes, this one takes a bit of time and patience but aren’t overly hard to make. Begin by heating the water to between 105 and 115 degrees F, remove from heat and transfer to a medium bowl, sprinkle in the yeast. Stir to dissolve and let sit for 5 minutes. Next, whisk in the milk, butter, egg yolk, sugar, and vanilla into the yeast mixture until combined. In a separate, large bowl, whisk together the flour, salt, nutmeg, and cinnamon. Then pour the wet ingredients into the dry ingredients and mix together with a wooden spoon until combined. Next, you’ll need to transfer the dough to a stand mixer fitted with a dough hook (or you can knead by hand) and mix on low speed for 8 minutes. Add the raisins and mix for 1 more minute. Spray a large bowl with cooking spray, form the dough into a large ball and place the dough in the bowl, cover with a dishcloth and place in a warm area to rise for 1 hour or until the dough has doubled in size. Punch the dough back down, recover with the dishcloth, and let rise for 15 more minutes. Preheat the oven to 375 degrees F and grease a 9×9-inch baking pan with non-stick spray. Then, divide the dough into 9 equal pieces and use your hands to work the dough into buns with rounded tops, place the buns in the pan and bake for 23 to 25 minutes or until the tops are golden brown. Finally, remove from oven and prepare the icing, add the icing while the buns are hot and serve immediately. Pin this Easter Recipe for Later! 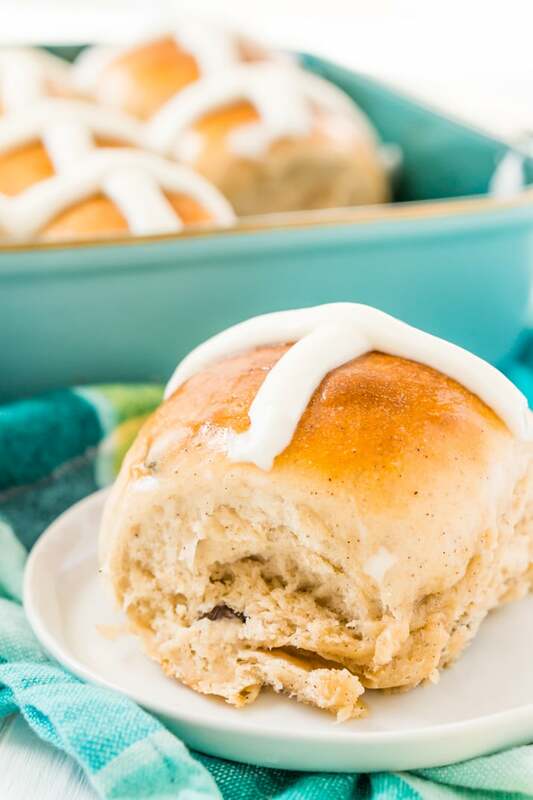 These Hot Cross Buns are a spiced sweet bun loaded with currants or raisins and topped with vanilla icing. They're a traditional Good Friday and Easter recipe! Heat water to between 105 and 115 degrees F, remove from heat and transfer to a medium bowl, sprinkle in the yeast. Stir to dissolve and let sit for 5 minutes. Whisk in the milk, butter, egg yolk, sugar, and vanilla into the yeast mixture until combined. Pour the wet ingredients into the dry ingredients and mix together with a wooden spoon until combined. Transfer to a stand mixer fitted with a dough hook (or you can knead by hand) and mix on low speed for 8 minutes. Add the raisins and mix for 1 more minute. Spray a large bowl with cooking spray, form the dough into a large ball and place the dough in the bowl, cover with a dishcloth and place in a warm area to rise for 1 hour or until the dough has doubled in size. Punch the dough back down, recover with the dishcloth, and let rise for 15 more minutes. Preheat the oven to 375 degrees F and grease a 9x9-inch baking pan with non-stick spray. Divide the dough into 9 equal pieces and use your hands to work the dough into buns with rounded tops, place the buns in the pan and bake for 23 to 25 minutes or until the tops are golden brown. Remove from oven and prepare the icing, add the icing while the buns are hot and serve immediately. Love the photos! The buns looked really yummy with the icing! I just love the fact you have made the cross on top with icing!!! Such a clever idea!!!! Yes, some people cut the crosses into the buns before baking, but I can’t resist the icing! 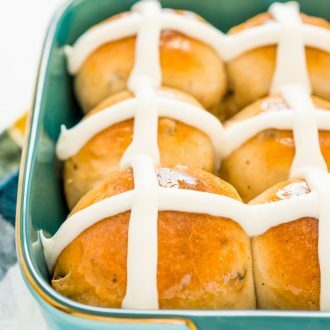 I love hot cross buns and these look simply amazing! So fluffy and rich! Can’t wait to try this recipe. They look delicious and I’m currently waiting the 5 minutes for the starter mix to work. Question though, does adding salt to the yeast, water, and sugar mixture kill the yeast? I did it, following the instructions, and then had an uh-oh moment when i started thinking about it. Do you have issues with the rise when you add salt to your starter mix like the recipe says? Hi MaryAnn, I’m so sorry, that was a typo and I had the salt being added twice. It should be mixed with the flour and added then, not with the yeast. The salt content should not have been enough to kill your dough, just would have made it slower to rise, I hope that the buns still turned out for you.